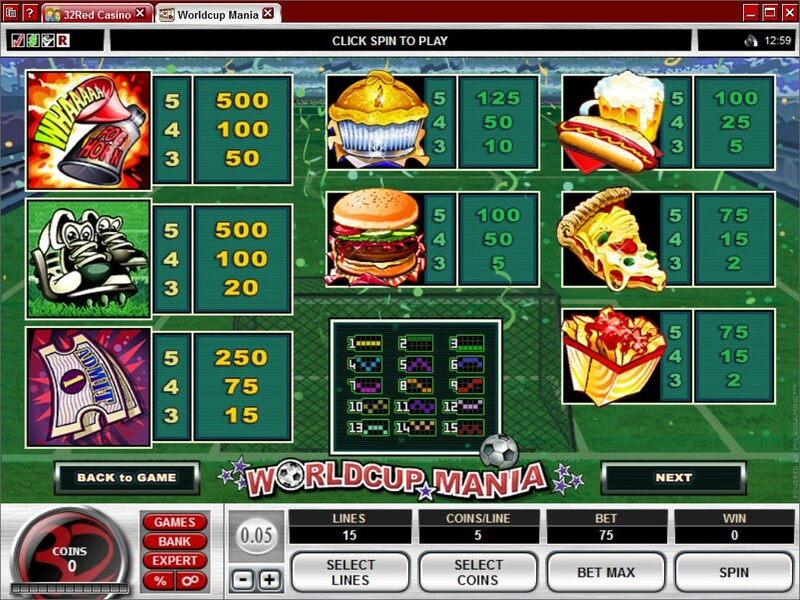 World Cup Mania is a Microgaming title which is obviously themed around the madness that takes over the entire world when the soccer World Cup is right around the corner. It only happens once every four years, but hundreds of million of people tune in to watch the games, most of them cheering for their national team. 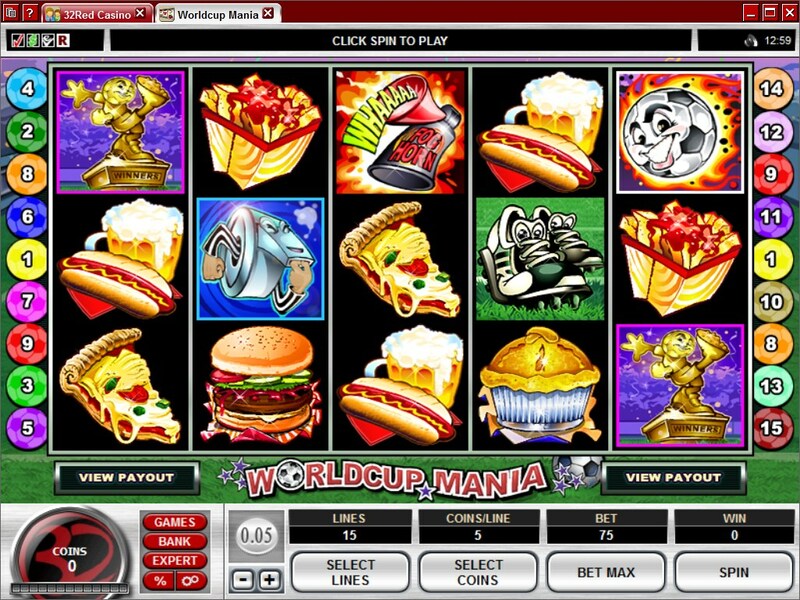 The theme of this slot is related to what you can get if you actually go to the match on the stadium or if you watched it in a sports bar, many of the symbols being various types of fast foods, some even accompanied by mugs of beer. 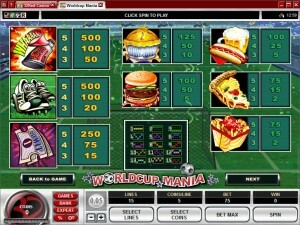 15 bet lines are used in Worldcup Mania, a 5 reel slot. Designed by Microgaming, it has a bonus game, free spins, 3x multipliers, scatters with big prizes and wilds which offer the 7,500x top jackpot, meaning up to $37,500. In World Cup Mania, you will get a couple of interesting features, starting with the scatter which offers prizes, free spins and multipliers. 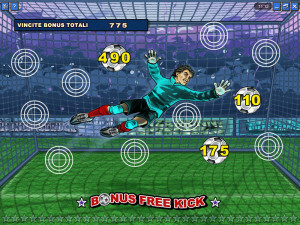 Next, we have the bonus symbol, which gives you a free kick themed feature. Finally, we have the wild symbol. The Football symbol will be used in this case as the wild feature of World Cup Mania. This symbol can appear everywhere and if it lands in the right position you can count on it to substitute for another symbol, helping it create its own combo with other matching icons that are already in place on the same line. It’s something that happens only once in a while, but you will find that you will get help from the wild Football often enough to notice the difference. The wild also awards its own payouts, as long as it manages to land multiple Footballs from left to right on one active line. If it happens, payouts as high as 7,500x will become possible. The Referee’s Whistle is the scatter symbol, the only one that is offered by the game. It can appear in any position on the 5 reels of the game, and if you have at least 2 or 3 present, you will be rewarded with cash prizes and free spins. The cash prizes need 2+ symbols and award up to 400 times the wager of that round. Access to the free spins is obtained with help from the scattered Referee Whistle, if it lands on 3+ positions during the same spin. You get 10 free spins if that happens, with the 3x multiplier tripling all the prizes. The free spins can be retriggered. The third feature symbol is one that has to appear on the same active line and form a combo of 3+ icons. It has the Winners Trophy on it and if you get 3 to 5 together you trigger the bonus. During this bonus, you have 3 to 5 free kicks to execute. Depending on the outcome of those kicks, you can win between 12x and 500x the line bet. 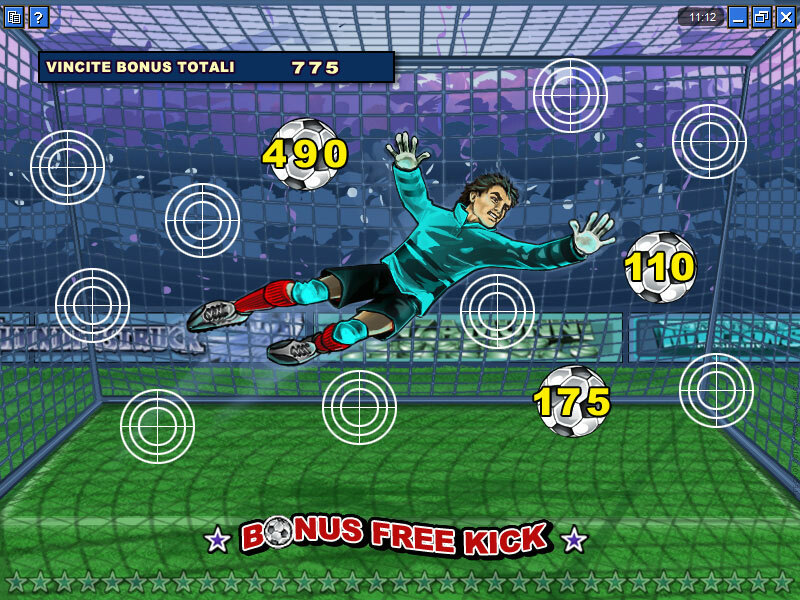 With all five free kicks offering the maximum amount, you can get up to 2,500x from this feature. A bet of $0.01 to $5 is possible on a single line, using a maximum of 5 coins with denominations of up to $1. Since you get 15 lines that you can activate, the maximum bet is $75. The wild’s top reward for you is a 7,500x line wager multiple, so up to $37,500 cash. The scatter offers a reward of up to $30,000 (400x the bet). It’s a game that you will find easy to enjoy, for a number of reasons. If you like the kind of foods that you eat at sports bars or at stadiums, you will find all those delicious treats among the symbols of World Cup Mania. The symbols which are themed directly around football consist of images with objects in them, but made into characters, as they have faces on them. The football and the shoes seem to be two of the players, while the Whistle symbol acts as the referee. Symbols: Referee Whistle (scatter, 400x bet), Winners Trophy (bonus), Football (wild, 7,500x), Fog Horn (500x), Boots (500x), Tickets (250x), Pie (125x), Hamburger (100x), Hot Dog (100x), Pizza (75x) and French Fries (75x). You’d obviously need to be a fan of football to enjoy this game, but that doesn’t mean that the theme is the only thing that saves it. It’s decent looking, it has good prizes and plenty of features. 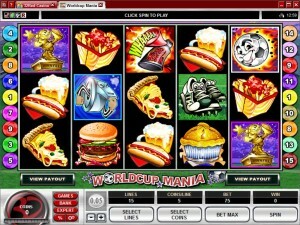 This World Cup Mania slot is offered by all online casinos with Microgaming software, playable either in practice or in real money mode.